If you follow me on Instagram, you know I’ve been complaining about the lack of rhubarb to be found in West Texas lately. It seems that all of the grocery stores (and weather, for that matter) went straight from winter to summer, completely skipping over spring. I searched and searched all of the grocery stores in town, from my regular supermarket, to Sprouts, to the hippy-dippy natural food store, for weeks, maybe even months, to find the elusive rhubarb, to no avail. The early weeks yielded only root vegetables, while the later weeks skipped right on to summer corn and tomatoes. (Though I won’t complain about berries and avocados being on sale seemingly the entire time!) I would get excited when I saw bright pink Swiss chard stalks from across the produce sections, only to be let down. Still no rhubarb. I had given up my (almost daily) search, accepting that I just wouldn’t get to create any rhubarb recipes this year. I’d just have to go straight into summer recipes. So I started planning for summer. But then – could it be? You may wonder why I wanted some rhubarb so badly. Well, until a couple of years ago, I’d never eaten rhubarb, let alone cooked with it. So the beautiful pink vegetable that always somehow ends up in desserts, is still kind of a novelty to me. Last year, I tackled the safe combo of strawberry and rhubarb. So this year, I wanted to try making something delicious with rhubarb alone. An easy recipe that could be an old standby each spring. I’d been planning this rhubarb compote for months. So when I finally got my hands on some rhubarb, I was thrilled! 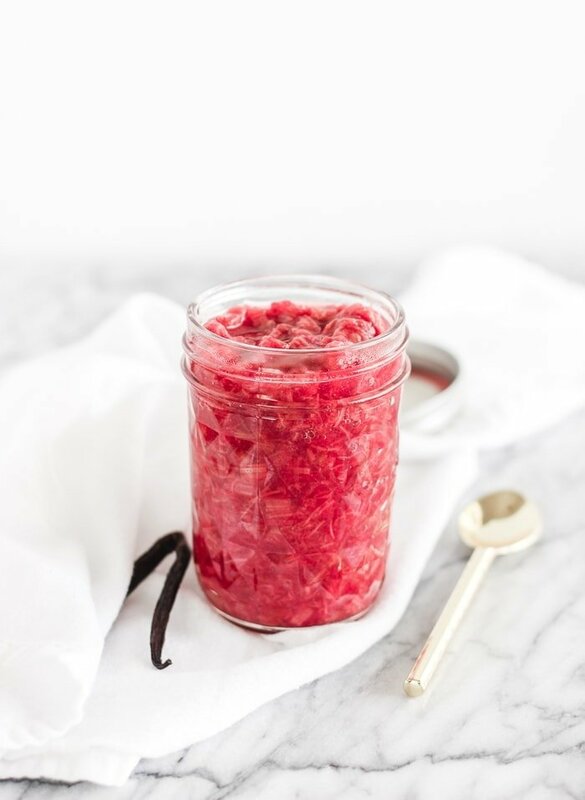 This vanilla bean rhubarb compote was definitely worth all the searching and waiting. It’s just as delicious as I imagined it would be. Sweet, with slightly tart notes, scented with heavenly vanilla beans. (real vanilla beans are very important in this recipe, so don’t skimp.) And a beautiful pink-red color that makes it dreamy to slather on everything. Of course the first thing I poured this honey-sweetened vanilla bean rhubarb compote on was oatmeal. 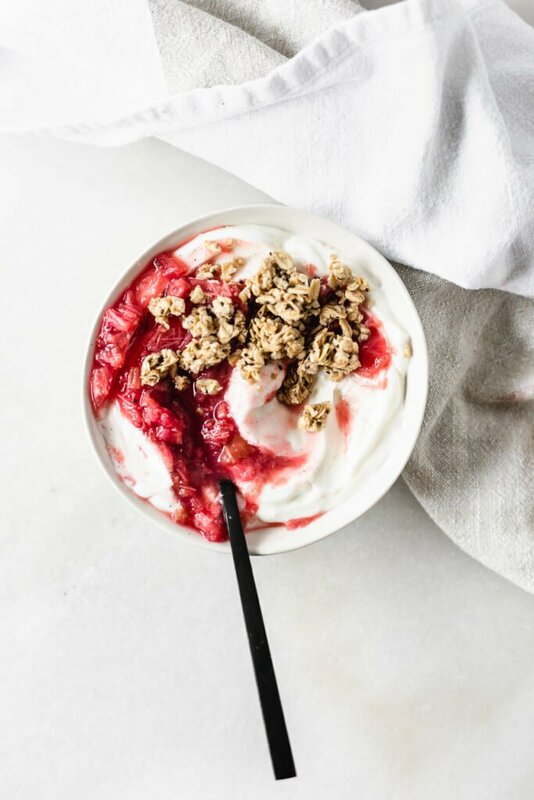 My favorite breakfast and a no-brainer for rhubarb compote and a dollop of yogurt. But it goes beautifully on just about anything else. Sourdough toast, yogurt, ice cream. You name it, this gorgeous compote can only improve it. It would be great for baking a crumble or tarts with. The possibilities are endless. But alas, rhubarb season is not. 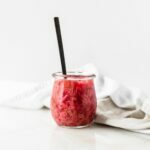 So you better hurry and try to find some rhubarb asap, so you can make this delightful compote while you still can! 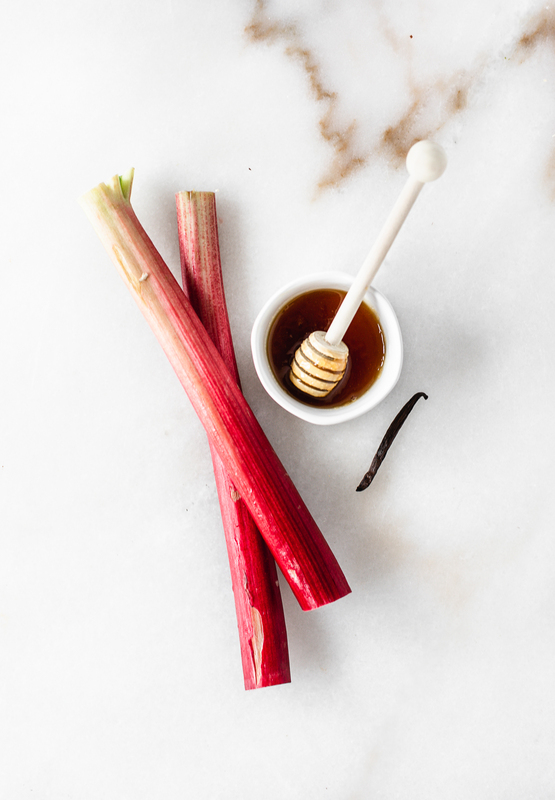 Place rhubarb, honey, and water in a medium saucepan. Scrape vanilla beans from the pod into the saucepan, if using. If not, add vanilla bean paste. Cook over medium heat until mixture comes to a simmer. Cover saucepan and reduce heat to low. Simmer until rhubarb is softened, about 10 minutes. Remove from heat and cool before pouring into a glass jar. Store in the refrigerator up to 1 week, or freeze.